As our top-of-the-line show controller, the V16X is uniquely suited to the complicated control needs and ease-of-maintenance demanded by themed attractions. This cutting-edge product features all of the interfaces commonly used within attraction systems including multiple Ethernet ports, serial, SMPTE timecode, digital IO, GPS, and a built-in LCD display. This allows the V16X to serve as the heart of the attraction and bridge the gap between functionality and guest experience! 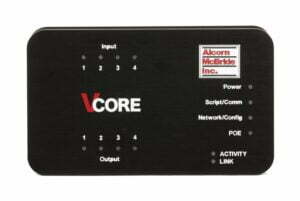 The V16X incorporates a completely new synchronization core that keeps perfect time using industry-standard methods like PTP, NTP, GPS, SMPTE timecode, and Genlock. 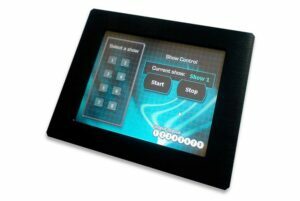 This new technology makes this show controller the perfect device to coordinate perfect synchronization between ride control, audio, video, lighting, special effects, and all of the other entertainment systems that must work in unison to ensure top-notch show quality. The V16X is not a computer. Its purpose-built design means it is capable of running your attraction with perfect consistency and absolutely no maintenance throughout the life of the attraction. With products like this, it’s easy to understand why the best attractions in the world have been relying on Alcorn McBride to run their show every day for the past 30 years. Our powerful scripting language for designing, testing and downloading your V16 Pro.